At the end of the 2000 Republican presidential primaries, then-Texas Governor George Bush had a problem. He was the choice of the Republican primary electorate, but election day voter polls in state primary after state primary still showed that roughly one-third of those surveyed thought Gov. Bush lacked “the experience and knowledge necessary” to be an effective president. Or words to that effect. Then-Gov. Bush couldn’t win the general election if one-third of his party’s electorate thought him unready or unqualified to assume the office of the presidency. So he dealt with his problem in one fell swoop: He tapped former defence Secretary (and former White House chief of staff and Congressional leader) Richard Cheney to be his running-mate. “It wasn’t Wyoming’s 3 electoral college votes I was after, I had those already” Bush said later. So effective was the Cheney choice that the Democrats never really raised the “experience issue” in the general election campaign. (A huge mistake on the part of Vice President Gore’s campaign, by the way, but that’s another story). At the end of the 2008 presidential campaign, the one thing that stood (and stands) between Sarah Palin and the 2012 GOP presidential nomination is this same issue: does she have “the experience and knowledge necessary” to be an effective president. Large numbers of Republican primary voters and caucus attenders in the early states think that Ms. Palin lacks what it takes to be president. If she can’t move that number down, dramatically, she won’t be the 2012 GOP presidential nominee. It’s that simple. For the last two years, Palin has been working hard to prepare herself for a 2012 presidential campaign. More precisely, she’s been working hard to make herself a formidable opponent. She certainly moved the needle in the 2010 mid-term elections; her support proved crucial if not decisive in any number of primary campaigns. Candidates she supported in the primaries fared pretty well, on balance, in the general election. You can read the scorecard here. But it’s one thing to catch a wave. It’s another thing to convince people that you can be trusted to lead the United States of America through one of its most harrowing passages. To do that, you need to project a commanding presence. To project a commanding presence, you have to show yourself to be in command of the subject matter. You need to know the theory of the case and the facts of the case and argue them in a way that convinces voters that you know what you’re talking about and you know what you’re doing. 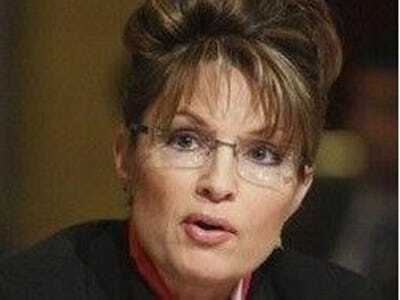 Ms. Palin has been working hard on getting herself ready to argue the theory and the facts of her case. She’s been cramming for the exam. The exam came in an unlikely place; the annual meeting of the Long Island Association. She was interviewed by the LIA’s president for one hour. She failed the test. She packed the house. The event was sold out and a second media room had to be hastily arranged. She was charming, at times, and funny. And she made some news. She argued against raising the federal debt ceiling. She got off a pointless and petty quip about Michelle Obama and the price of milk. She criticised President Obama for not speaking out in support of the Green Revolution in Iran in 2009. But she didn’t convince anyone in that room that she had the “experience and knowledge” to be the next president of the United States. Ms. Palin doesn’t so much answer questions as she does surround them with words. At times, it’s hard to parse exactly what it is she’s trying to say. She’s not crisp. She hasn’t mastered the basic material. When you listen to her talk, you find yourself hoping that she gets to the end of her answer in one piece. You don’t really listen to her answer. It’s possible that this won’t matter; that Palin’s star power and personal connection to conservative primary voters will be enough to get her into contention for her party’s nomination. But it’s not likely. Voters are really worried about where the country is headed, where the economy is headed, where the world is going. Politicians like Palin are enjoyable when times are good. They shake things up. But they’re unattractive when times are bad. You don’t want things shaken when things are shaky. Ms. Palin now has two choices. She can raise her game or she can not run. If she can’t raise her game, she would be well-advised not to run.